FOX8's superhero shows will finally return to screens this week with the biggest lineup of comic book properties in recent memory. There is almost a different hero for every day, with Friday's long-awaited debut of Legends of Tomorrow one to watch out for. Sunday nights belong to Supergirl. Which DC Comics television show do you enjoy most? This poll ended on 23 January 2016. The 7.30pm (AEST) program currently carries the lowest numbers in terms of viewership (the January 17 double episode garnered 45,000 and 41,000 viewers respectively), but is beginning to craft itself into a solid series. The biggest problem faced by Supergirl is that the series is so far behind its original air date in the United States. Now it is only two weeks behind, but when it premiered in Australia it was as many as five or six episodes behind. 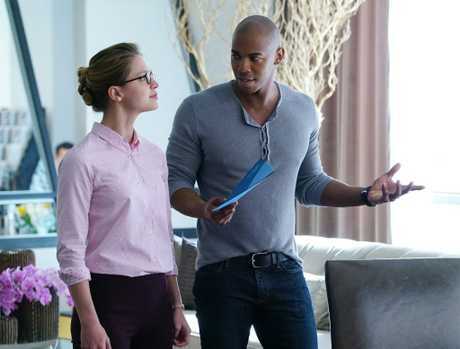 Melissa Benoist and Mehcad Brooks in a scene from the TV series Supergirl. Supplied by Foxtel. It meant fans could have accessed the content by other means (i.e. downloading) rather than waiting for it to air on Australian screens, while followers of the show's social media accounts (or comic book, TV news and other pages) had key moments spoiled a month ahead of time. 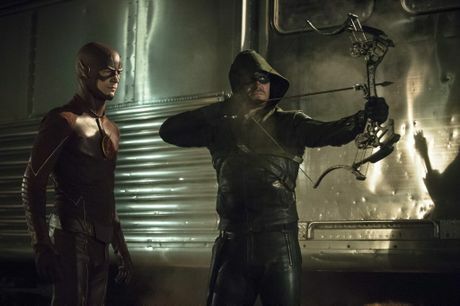 Grant Gustin, left, and Stephen Amell in a scene from the crossover episode of TV series Arrow and The Flash. Supplied by Foxtel. The Flash (Wednesdays at 6.30pm AEST) and Arrow (Thursdays at 6.30pm AEST) had that problem in recent years, but the decision to "fast-track" episodes this season has made it a much more enjoyable experience to follow the shows. Sure, there is still about a six-hour gap between its initial air time in the US, but for the most part, Australian fans can enjoy the series with the rest of the world. The Flash and Arrow have both built towards Legends of Tomorrow's debut on Friday night (7.30pm AEST), and it promises to deliver a new experience for fans. Arrow has been a more dark, gritty tale for its four seasons so far, while The Flash has been much more "light" and jovial. Legends of Tomorrow appears to be more of the latter but with the freedom of time travel, and promises to tackle a range of different genres and settings while following the exploits of eight of DC Comics' heroes.